Australia have made eight changes while Wales retain the majority of their starting XV for the World Cup third-place play off on Friday. The Wallabies make six changes to their pack, including the recall of Nathan Sharpe who will win his 100th cap in the absence of the injured Dan Vickerman. No.8 Radike Samo and flanker Rocky Elsom are replaced in the back-row with Scott Higginbotham and Ben McCalman. While James Slipper, Tatafu Polota-Nau, Salesi Ma'afu form an all-new front-row with openside David Pocock and skipper James Horwill the only survivors in the Wallabies pack that was outmuscled by the All Blacks in the semi-final. Kurtley Beale is back at fullback after recovering from a hamstring injury. Therefore Adam Ashley-Cooper moves to outside centre with Anthony Faingaa dropping to the bench. Berrick Barnes takes over from the injured Pat McCabe at inside centre. Wales have filled the void left by skipper Sam Warburton with Ryan Jones packing down in the back-row and Gethin Jenkins assuming the captain's armband. Jones takes over at No.8 with Toby Faletau moving to openside flanker. Paul James keeps his place at tight-head prop after replacing the injured Adam Jones during the defeat to France while Bradley Davies is preferred to Alun-Wyn Jones in the second row. Elsewhere James Hook is retained at fly-half despite a poor display in the semi-final with Stephen Jones again on the bench. Australia: Kurtley Beale; James O'Connor, Adam Ashley-Cooper, Berrick Barnes, Digby Ioane; Quade Cooper, Will Genia; James Slipper, Tatafu Polota-Nau, Salesi Ma'afu; James Horwill (capt), Nathan Sharpe; Scott Higginbotham, David Pocock, Ben McCalman. Replacements: Saia Faingaa, Ben Alexander, Rob Simmons, Radike Samo, Luke Burgess, Anthony Faingaa, Rob Horne. Wales: Leigh Halfpenny; George North, Jonathan Davies, Jamie Roberts, Shane Williams; James Hook, Mike Phillips; Gethin Jenkins (capt), Huw Bennett, Paul James; Bradley Davies, Luke Charteris; Dan Lydiate, Toby Faletau, Ryan Jones. 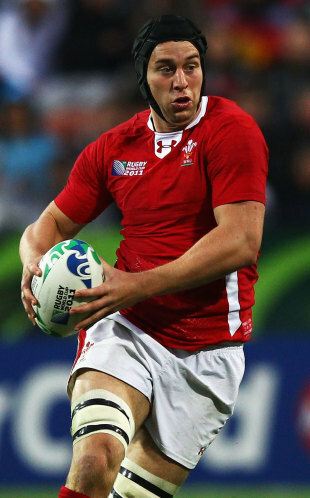 Replacements: Lloyd Burns, Ryan Bevington, Alun-Wyn Jones, Andy Powell, Lloyd Williams, Stephen Jones, Scott Williams.